Typical tou rism products of the northern mountainous province of Lao Cai have drawn increasing attention from foreign travel publications, a senior official of the provincial tourism sector has said. Tran Huu Son, head of Lao Cai’s Department of Culture, Sports and Tourism, cited that Australia’s travel magazine Lonely Planet has listed Sa Pa as one of the 10 best walking sites in the world for tourists, while Sri Lanka’s Serendib has described Bac Ha minority cultural market as one of the 10 most attractive markets in Southeast Asia. 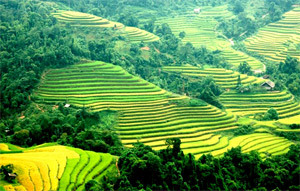 Besides, US-based Travel and Leisure Magazine has named Sa Pa’s terraced rice fields as one of seven most magnificent examples in the world, he added. Defining tourism as the key sector in the province’s economic development strategy, Lao Cai has exerted efforts to actively promote its tourism products through various events such as the Fansipan conquering programme and Bac Ha traditional horse racing, Son said. Besides, Lao Cai has also taken part in many international tourism fairs to introduce its tourism information and its tourism cooperation programmes with seven other northwestern provinces to domestic and foreign visitors, added Son. Nguyen Thanh Duong, Vice Chairman of the provincial People’s Committee emphasised the unique identity of Lao Cai and economic potential from the tourism sector. He underscored the necessity to maintain and develop the local cultural identity and artisans’ skillfulness and improve the quality of tourism facilities and services. Lao Cai has implemented measures to better its tourism environment to attract more visitors. In the 2011-2013 period, the total number of tourists to the province totalled over 3.1 million. The tourism sector helped the province earn more than 5,600 billion VND and employs 8,150 locals.